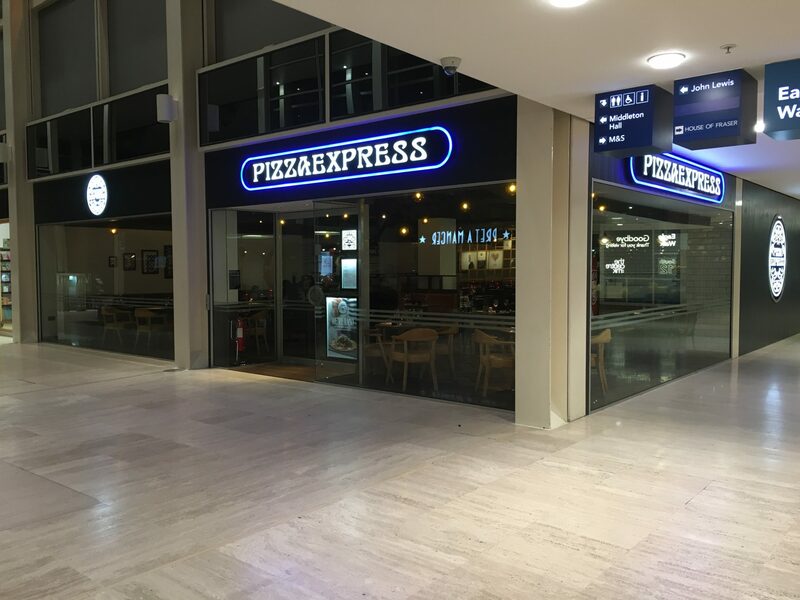 Pizza Express is one of those restaurant chains that now appears on every high street up and down the country and they all look and feel the same. That does of course bring a sense of familiarity to the brand but it also means a lack of personality and localisation. It does therefore make you stick to the same restaurant each time as quite frankly, what’s the point in going further away for the same experience. 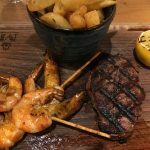 I for one am always keen to try out new things and have new experiences and I particularly enjoy heading to new restaurants however Pizza Express is one of those chains that I would happily head to again and again, I’ve never had bad service and the food has always tasted great. 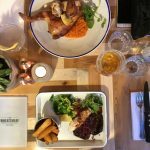 It was therefore great to receive an invite from them to head across to their newly refurbished restaurant on Midsummer Arcade in Milton Keynes for dinner. Being local to the Pizza Express in The Hub, I very rarely head to this restaurant (in the Centre:MK by John Lewis). I have eaten there previously however it was a long time ago and it’s always for lunch due to convenience whilst shopping. 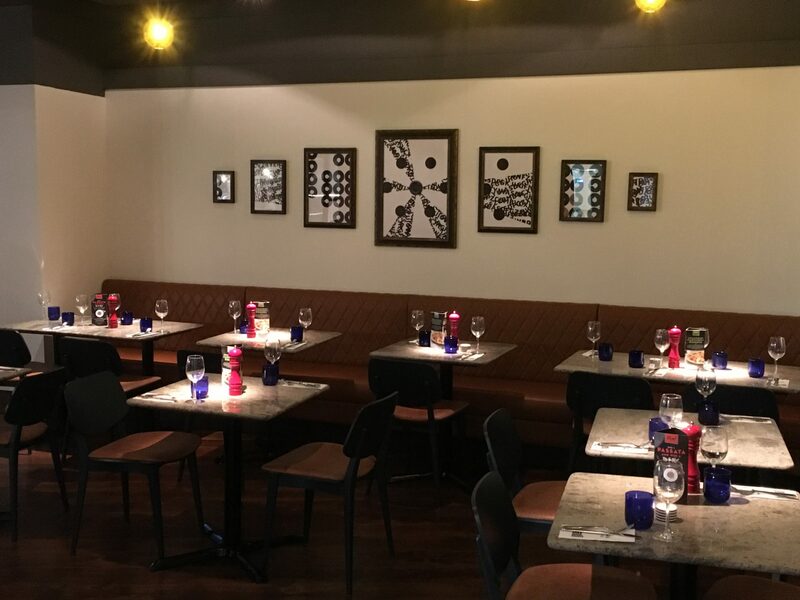 The new look restaurant presents a much more modern style with it’s dark ceilings, improved lighting and leather bench seating. 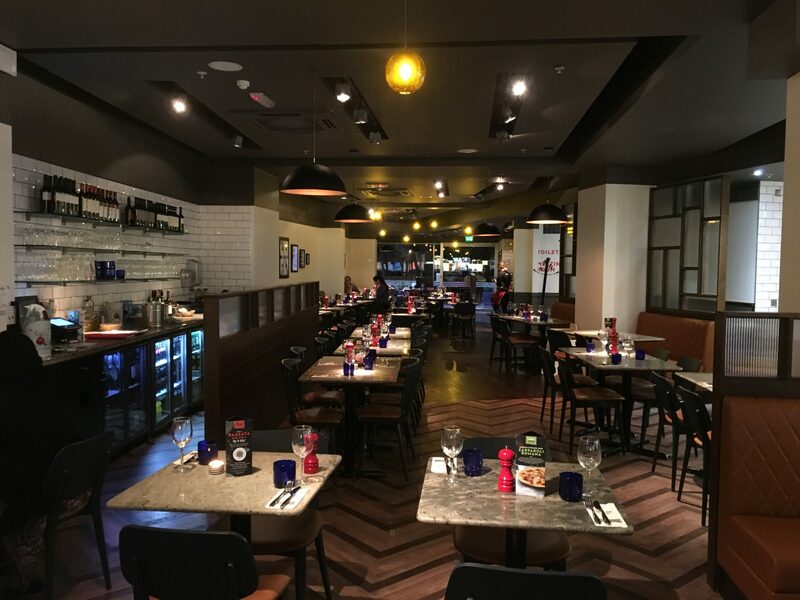 It certainly creates a more premium environment to what you would typically experience at Pizza Express. 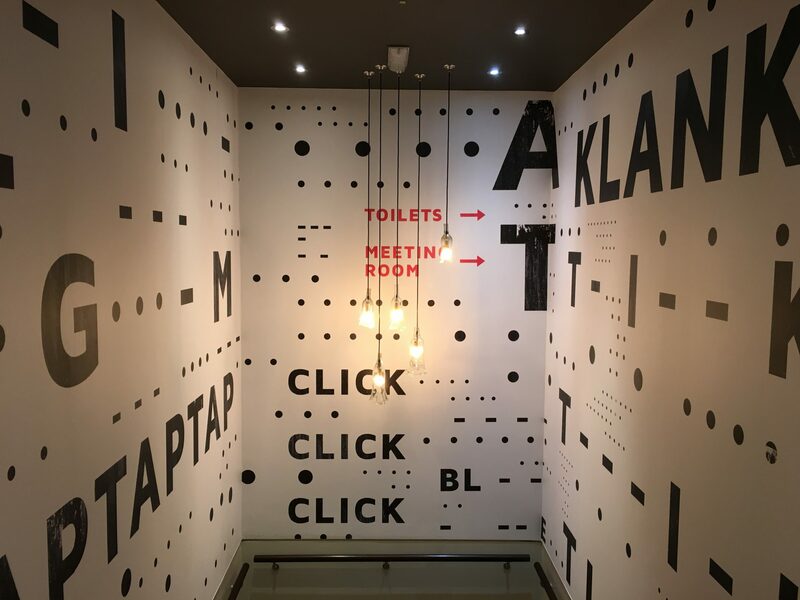 The new look restaurant has a large display of artwork throughout which draws heavy inspiration from Bletchley Park’s secret code deciphering projects during World War II. Specifically, this artwork relates to Alan Turing’s Bombe which was used to crack the German code before then using Enigma machines to decipher the German messages and shorten the war by it is claimed around 2 years. 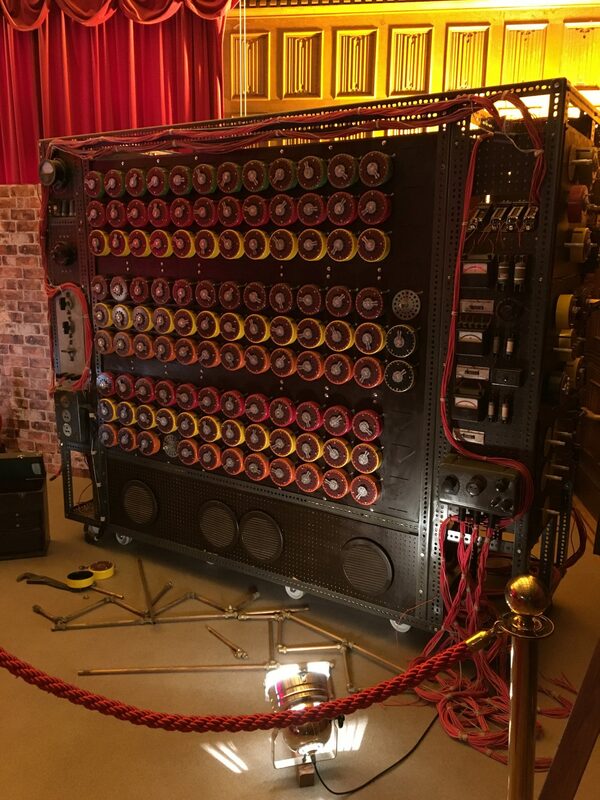 Last year I actually headed just down the road to Bletchley Park where the German codes were cracked and took a couple of photos of replica’s of Turing’s Bombe so you can see exactly what Pizza Express were aiming for here. The artwork reflects the numerous dials and the staircase reflects both Morse code and the noise that the Bombe made during operation. So what about the food? Well, on arrival we were met by the extremely welcoming Paul who did a superb job of both keeping us entertained and attending to us throughout our meal. 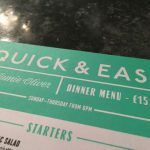 He explained that Pizza Express had a new Spring menu which had been significantly reduced – both in terms of quantity of food options available and also physical menu size. Paul also informed us that the chain had introduced fish onto the menu and made a number of recommendations about what to order. As previously mentioned, being someone who likes trying new things I picked a series of food options from the new Spring menu that I wouldn’t typically think to choose. 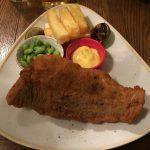 Whenever I eat Italian food I like to keep my choices simple – stick to beer and always go for a Peroni as a reliable, safe choice that won’t leave you disappointed. Sarah on the other hand ordered a Hugo St. Germain from the Spring menu which was a special. 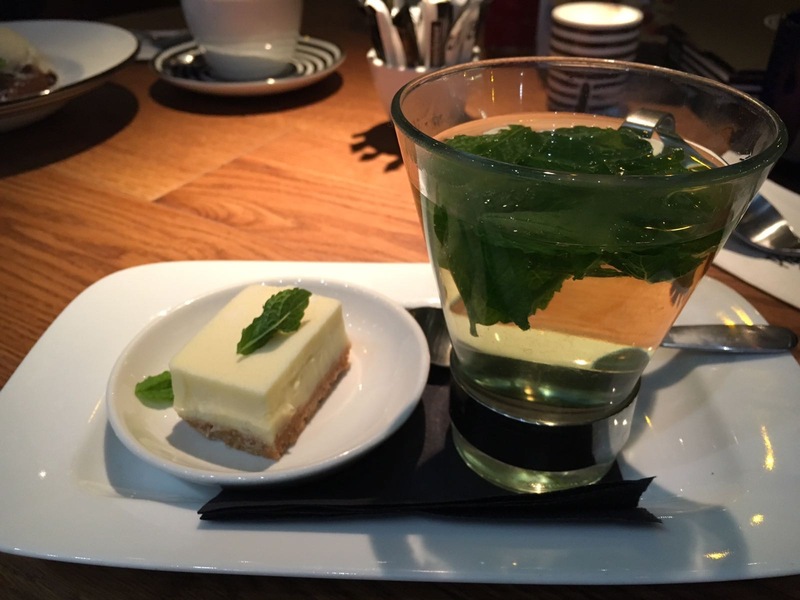 This consisted of Prosecco over ice, with St Germain elderflower liqueur, lemon and mint – I tried some of it and really tasted good and certainly refreshing – it would no doubt be a great drink on a hot day! For my starter I opted to go with the classic Italian Antipasto which comprised of a new menu for Spring. 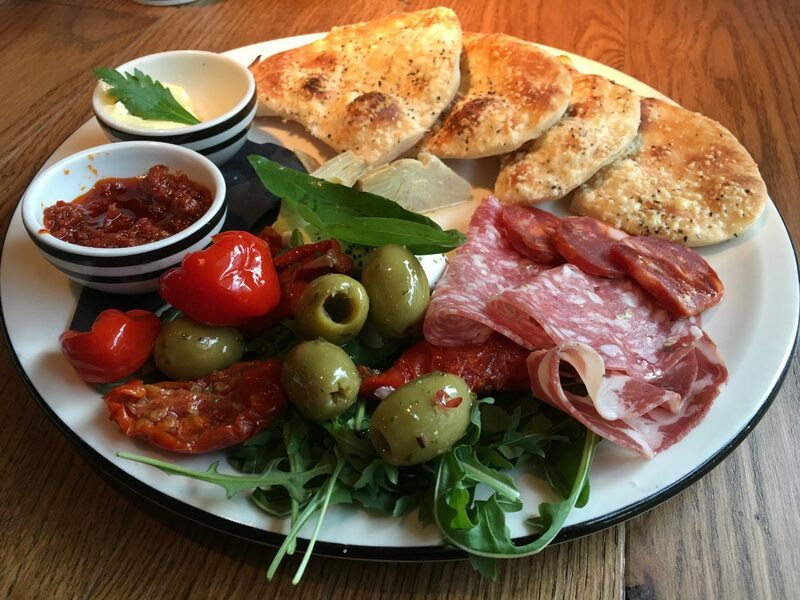 This included Italian meats (Finnochiona, Coppa, Milano salami and Calabrese sausage), olives, artichoke, roasted tomatoes, buffalo mozzarella, sweet Peppadew peppers and dough baked with Gran Milano cheese, accompanied by garlic butter and pestorissa, a harissa spiced tomato dip. It was good. Really good. Not only did it taste good, it looked great too. Sarah went with the Cod Crocchettes which were also new to the Spring menu. 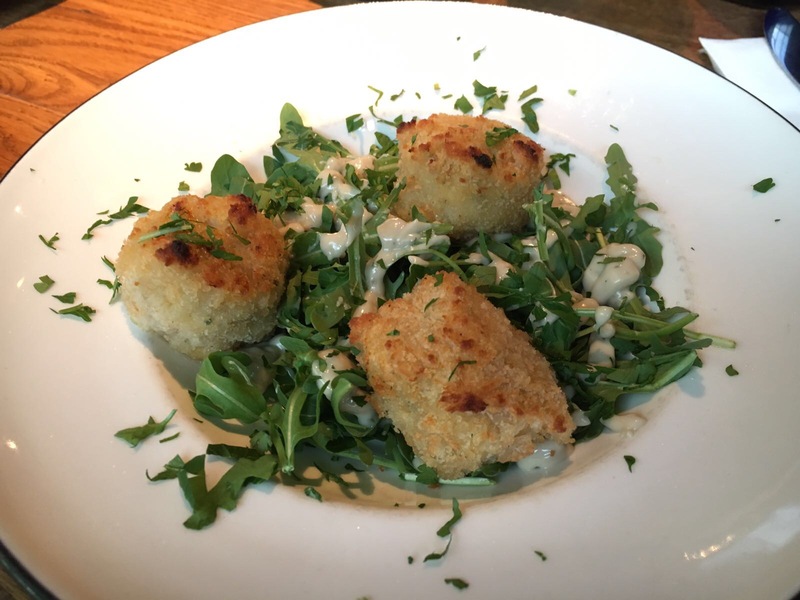 These comprised of creamy smoked cod with mozzarella and a red jalapeño kick, rolled in breadcrumbs and baked until golden brown, served with rocket, parsley and an anchovy mayonnaise. 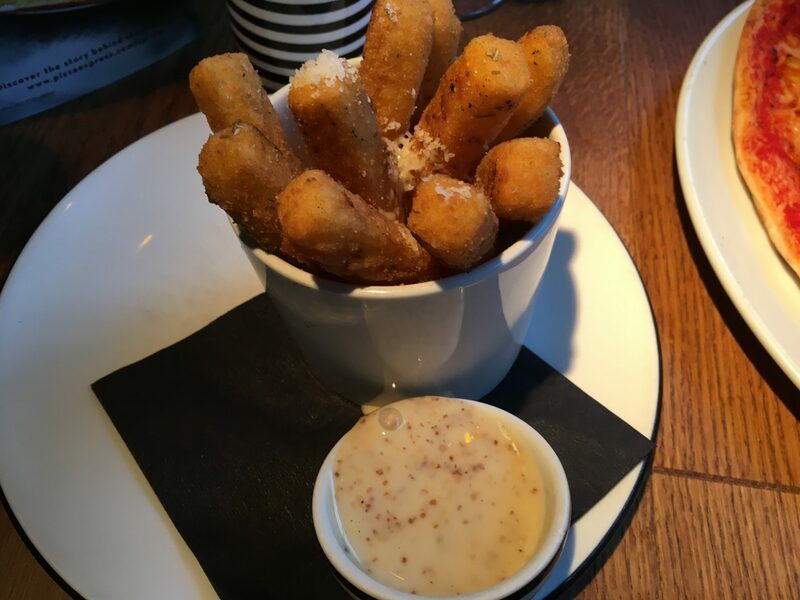 These were packed full of flavour and although not a starter I might typically go for, they would certainly be something I would consider ordering again,. With the starters out the way we waited for our mains to arrive which like every visit I’ve had to Pizza Express previously, didn’t take too long at all. They arrived at the table perfectly cooked, still hot and looked the business. For my main I tried the new Zapparoli Romana as recommended by Paul from the new menu. 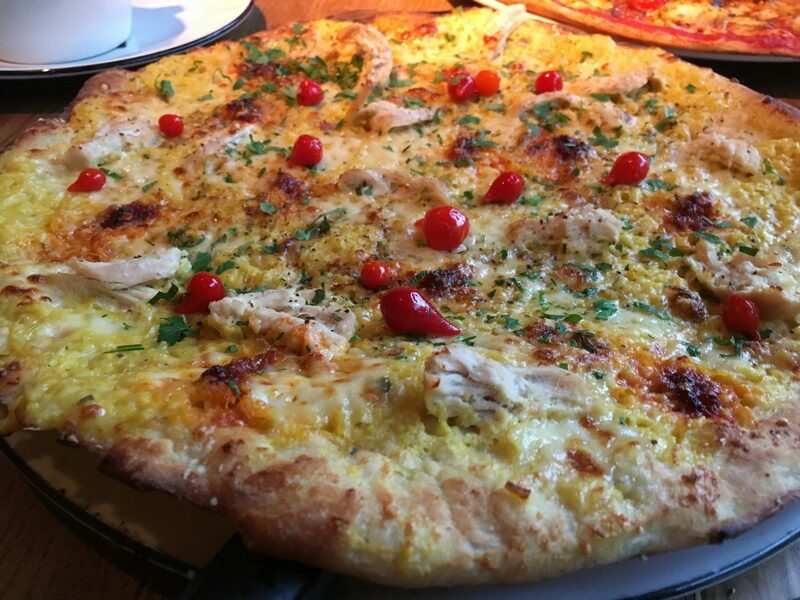 This was a spring special comprising of chicken, hot soft ‘nduja sausage, mozzarella, garlic oil and Gran Milano cheese on smoky, creamed corn finished with red Roquito pearls and parsley. This was definitely a different type of pizza to what I would usually go (typically a Diavolo or American hot) for but I really enjoyed it. 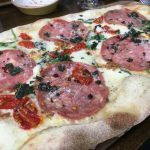 The pizza combines a lot of flavours that work really well together and the inclusion of the Roquito pearls was certainly something I’d never seen done before which made a great touch. For Sarah’s main, she opted for a Pollo ad Astra on the thinner Romana base – a creature of habit, it was her usual! 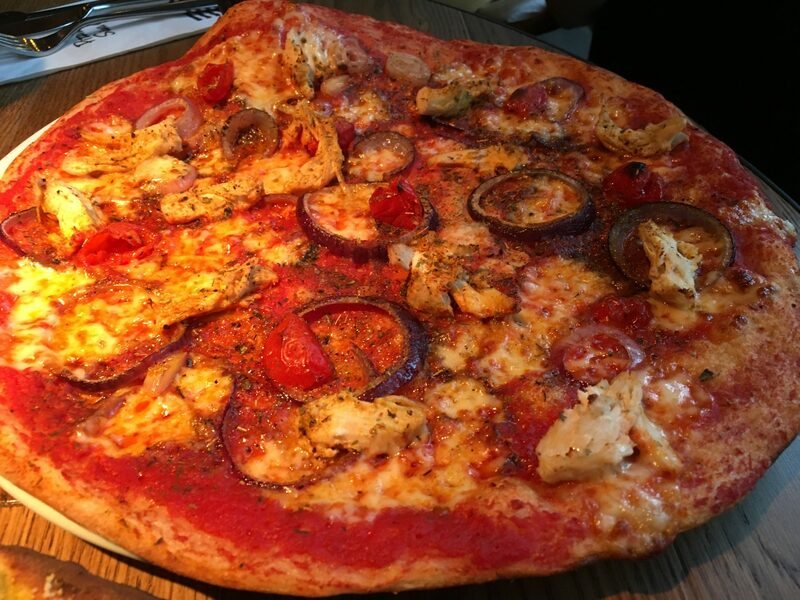 This pizza was one of the standard Pizza Express options consisting of chicken, sweet Peppadew peppers, red onion, mozzarella, tomato, Cajun spices and garlic oil. Like my own choice this pizza is packed full of flavour however having tried both this and the Zapparoli Romana I really preferred my own option. To accompany our mains we also ordered ourselves something else new from the menu as recommended by Paul which were the Polenta chips. Pizza Express describe these as, Italian polenta chips with rosemary, oven-baked and finished with Gran Milano cheese, served with a honey & mustard dressing dip. Now these were definitely different and I can tell that they will be a bit of a love it or hate it option for many. Personally I really enjoyed them at first but as I ate more of them I drifted toward wanting something potato based! I think they were great to try and if I only had to eat a few I would really enjoy them but I think eating a lot of polenta in this format probably isn’t something I’ll opt for on my next visit! Don’t get me wrong they weren’t bad tasting or anything like that, I think I’m just far more used to eating potato sides with pizza and so just couldn’t get my head around this one! At this point of the meal, after 2 courses, you know the deal – “would you like to see the dessert menu?” gets asked. You look at each other across the table with a tentative “should we?” look and make that statement, “yeah I think we’ll take a look” full well knowing that you need to undo your belt a little. But let’s face it, desserts sit in a separate stomach and you can always find some room. With that, the menus arrived and we quickly ordered. So for my main I went with a love of mine – chocolate fondant – an easy choice. 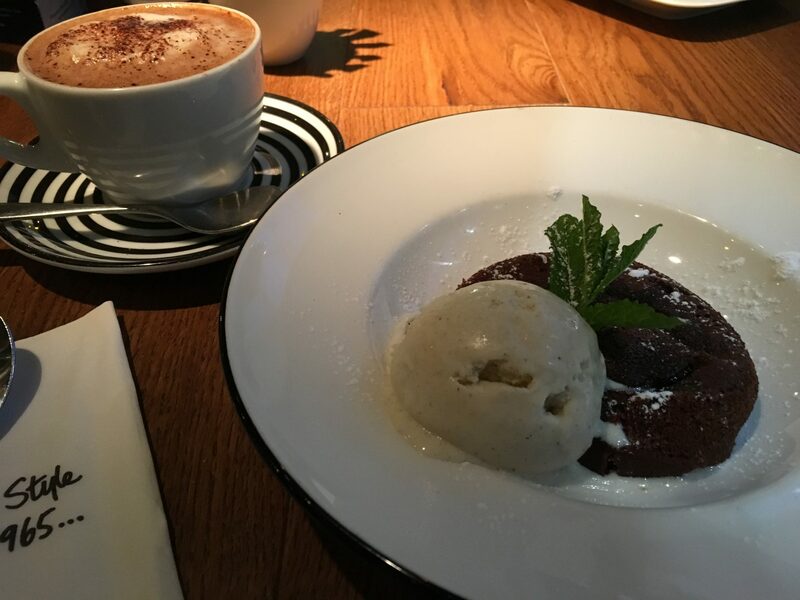 Described as a rich and intense warm chocolate cake with a soft melting centre, served with vanilla gelato, fresh mint and icing sugar, it was pretty hard to resist. By this point and with all consideration for calories consumed going out of the window I threw in a mocha for good measure. Sarah was a lot more restrained with her dessert choice and went with a Lemon Posset Crunch mini dessert (dolcetti) served on a ginger biscuit base. This was served with a cup of mint tea. 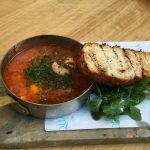 My visit to Pizza Express on Midsummer Arcade was a really positive one. 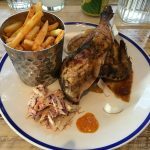 The fresh look and feel of the restaurant was inviting and I loved how they had localised everything around Bletchley Park which the city is and should be very proud to have on our doorstep. 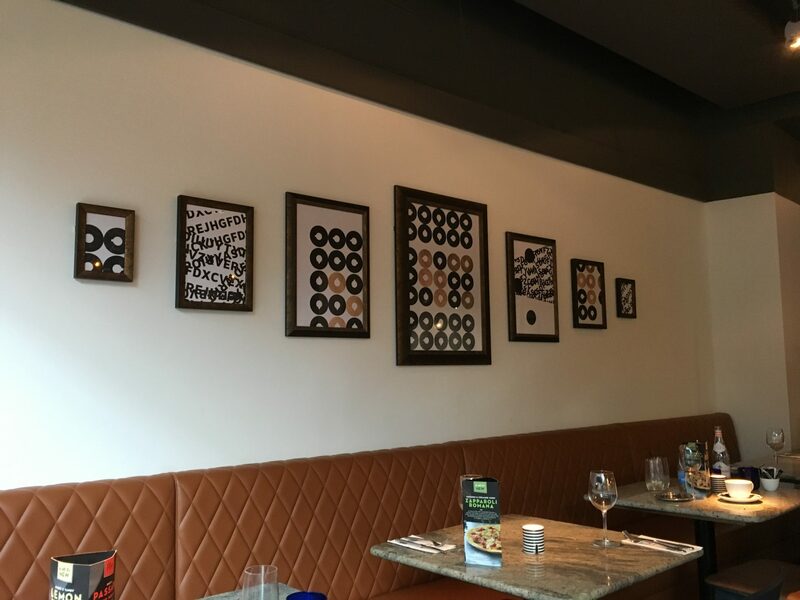 I think to many people visiting the restaurant who aren’t familiar with the code breaking machines they may not understand what the artwork is about however for me personally I think, with the exception of the staircase, the subtlety of it all is great. The new Spring menu was also very refreshing and it made a nice change not to order all of the usual suspects that I would typically go with. All aspects of the meal were really enjoyable. Finally our meal was made all the more enjoyable by Paul who served us for the majority of the meal. He made some excellent recommendations, kept us entertained and was really attentive throughout. As his shift finished we were then looked after by Maria (notably with a C!) who continued to keep our experience really positive. 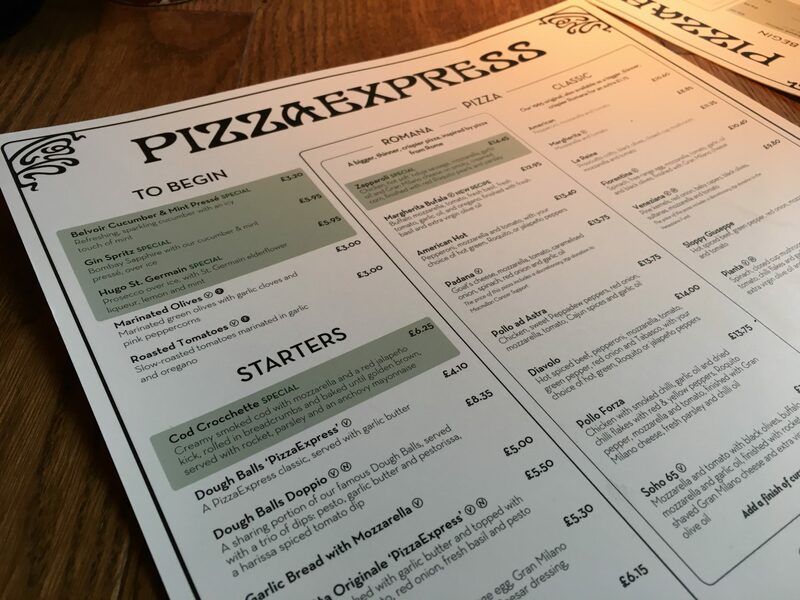 Thanks for inviting Sarah and I to the restaurant Pizza Express, we had a great time – if you’re in Milton Keynes and don’t usually head here for dinner I would certainly recommend to go take a look and also try out the new menu as there’s some fantastic new options available – 9/10.